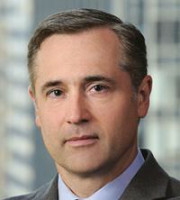 Paul A Bondor is a partner of Desmarais LLP, where his practice focuses on the litigation of complex technology-driven disputes, particularly patent infringement jury trials. Mr Bondor started his career as a law clerk for Judge Louis L Stanton in the US District Court for the Southern District of New York. After his clerkship, he began private practice with Kenyon & Kenyon, where he was elected partner in 2001. In 2004 John M Desmarais asked him to join the New York office of Kirkland & Ellis LLP as a partner in the IP litigation group. After seven successful years at Kirkland, Mr Bondor again joined forces with Mr Desmarais to build Desmarais LLP. Mr Bondor is admitted to the Bars of New York and the District of Columbia, as well as the US Court of Appeals for the Federal Circuit and various federal district courts. He is also registered to practise before the US Patent and Trademark Office. Mr Bondor graduated from Princeton University, where he studied mechanical and aerospace engineering, and the University of Michigan Law School, where he served on the Michigan Law Review.